Afternoon surf at maile pt. had to pick the right one! Swell peaked, so more spots will be rideable tomorrow. So I am standing in line and start ordering 4 of this, 6 of that, 5 of this, 2 of that... My lunch has now become our dinner, as the bill totals $70.71! What no can return? Looks likes my eyes were to big today. What should I eat? Kind of hungry. South swell in January? 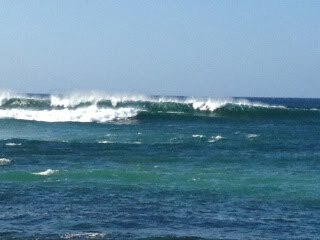 Yes, past few days have been fun with head high surf gracing the south shores of Hawaii. Today I pulled up to diamond head and it was going off! So good that even world champion Carissa Moore paddled out with her dad and sister. Tomorrow north shore will be the call. Another beautiful day in paradise. Did some work in the morning knowing the ocean conditions were primo so made a few calls and my friend Travis Masutani just so happen to get off work early so we boarded the Red Sea Yak and went for a afternoon swim. Our target was reef fish so we focused on anything red in color. I saw a school of nice 10 lb omilus but they happened to see me first and swam away. After a couple of hours we had enough fish for the week and called it a day. Thanks Trav for a fun day on the water. Can't wait for tomorrows dinner! 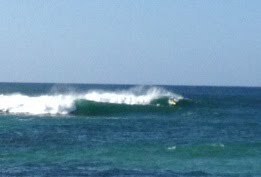 SOUTH "Kona" winds continue to blow throughout the Hawaiian Islands and swell is still pumping up north so schedule was to get some waves, eat, and edit the rest of the day. We pulled up to one of our favorite spots and since it was a holiday, the rest of oahu had the same plan. By the time we put on our swim shorts the line up had 40 guys out with no waves going unridden. So my surf partner James aka "McGuyver" pointed us to his SECRET spot and we scored with just 10 of us out. 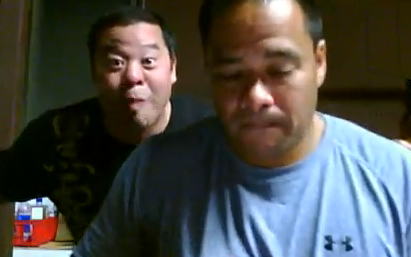 My other buddies, Kekoa Mau (left) and Matt Wakabayashi (right) joined us as we took turns on some good waves. We are gearing up for a surf trip soon so it was a good time to discuss our plans and test out our quiver. Kekoa turned me on to another SECRET spot with some good grinds. I waited to see what he ordered then ordered the same thing (teri-cheeseburger) and SAIMIN! This hit the spot! We talked more about the trip then headed home to do some editing for the next the HSDTV show. Thanks guys for a fun day and sharing your secret spots! Last night we got to celebrate Brent Chings birthday at his favorite restaurant, Burger King. I think he wanted to be the "King" for the day so we honored his holiness. Brent has finally got his new dive hood so no more limu growing off his head from his ripped up hood. What a beautiful day in Hawaii! 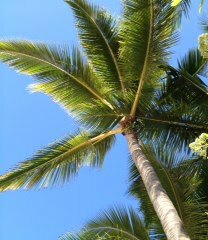 Blue skies, coconut trees, and lots of surf on the north shore! Finished up the work and headed up to the country to see what was happening. When I first pulled up to Jockos saw some nice overhead lefts with only 4 other guys out. What only 4 guys out, how come? Shark, current, work? So I waxed up and went out. Couple bystanders also checking the surf and debating what to do also. Then the double overhead sets started rolling in and current started pulling hard. Non-stop paddling all the way with a couple close out sets made the day complete. Got a few good ones, got caught inside, and decided to head in before I got swept out to sea. As I exited the water I saw another couple debating whether to go out or not. Be careful of the strong currents when you go surfing or diving! Weather this weekend was looking good for a dive so got a invite to go for a quick dive. Finished up the work at 1:00 am and woke up at 6:00 am to meet the boys down at the pier. Capt. Dell, First mate Greg, Brent, Danny, and Nathan were also on board todays dive. The 8-12 ft northwest swell was wrapping around the east side so it made for some challenging diving but with a big 22 ft twin vee boat who cares. The boys still managed to get some fish for the week. Mix bag of reef action was perfect for everyone. The top catch today was a huge..
Moana Kali (blue goat fish) which Nathan speared. It probably was close 3 1/2 pounds and I'm sure he will be enjoying it this week. Great job Nathan! We couldn't eat on the boat because it was rocking and rather than throwing up on board we came in for lunch and the musubi's brent brought was ono. It's so neat to meet others who share the same passion for diving and I look forward to more dives together with these guys. 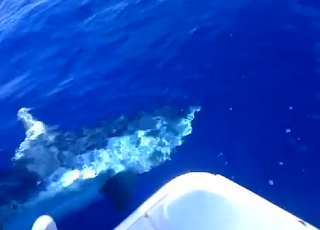 Hopefully they can join us on a future Red Sea Trip! Thanks again Brent for inviting me! Past few ocean experiences have had a lot of current lately. Last week went kayak diving and almost go sucked out to sea, and today I pulled up to the beach at Jockos to get wet and it was deja vu. There were lots of onlookers soaking up the sun and watching the new north shore swell building. Crowd doesn't look to bad so go I grab my 7'2" board and wax up. Head down to the shore line and see this sign "Strong Current". I've seen it all the time the waves are big and so I walk right passed it, jump in, and paddle out. Water feels good, clean, cool, and as I get out I see everyone stroking for the channel, how come? I see one guy broken board paddling in. The see another guy outside stroking inward toward shore. Then, I look up at my line ups and see the current is on! All the surfers stroking for the channel...Constant non-stop paddle required for todays session. I see a wave come in, and decide to take it so I don't get sucked out to sea. Should I go back out? Yes! one more time around the merry go round and out to sea, paddle, paddle, paddle then get another good one without falling. A big set comes in, closes the channel and I see another broken board and the guy struggling to get in. These are those days you just need a few good ones to make your day. Thank God for the adrenline rush! New Hawaii Skin Diver TV episode premiers tonight at 8:30 pm on OC16. Our host Merlinda Garma will take you on a journey down under to Australia's Coral Sea as Hawaii Skin Divers hook up with legendary Australian spearfishing champions Rob Torelli and Andy Ruddock. Big Surf coming this afternoon up north so gotta finish my work so I can catch a few waves! Have a nice day! Happy New Year Everyone! Last day of 2011 I went diving south shore and today I went surfing north shore so great way to start the year! Had some friends and family over for yesterdays celebration and this is how we do it. First slippahs are always kept outside the house and if you are lucky you may even leave with a new pair of slippers than when you arrive. This is local style. Top of the list is FRESH FISH, and we had a lot! Poke, sashimi, cajun style was all there. The whiter colored fish is Hamachi and one of the best to eat. If you go to the market to buy this expect to pay $30/lb. Kids were first in line and Kazu and Kai knew what to do. Erick and Galen were in the house and great to have such awesome friends to start the new year off. Of course the finally was with homemaid pies. We had Teds, Galens, Alans, and Matts specialty pies and cakes to top it off. I think I gained 10 lbs during lunch today. This is going to be a busy year for me and hopefully bigger and better things will be happening in 2012. But first, gotta go back to the beach to burn off some of these calories!